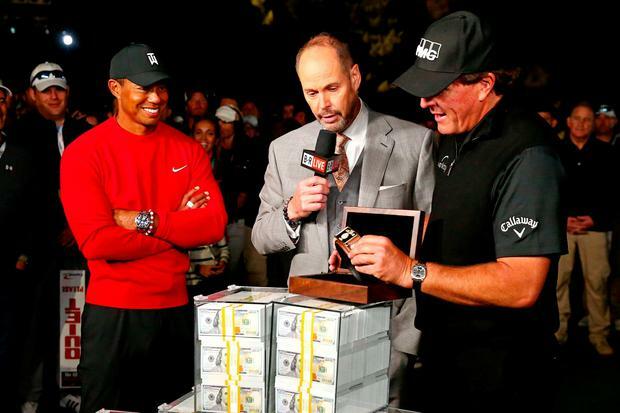 It took the addition of floodlights and a makeshift 93-yard hole, but Phil Mickelson finally beat Tiger Woods in near-darkness to win their $9million showdown in Las Vegas. Mickelson birdied the fourth extra hole at Shadow Creek to win a low-quality contest which failed to live up to the hype and was eventually decided by little more than a pitch-and-putt competition. The five-time major winner also recovered from losing a 200,000 dollar sidebet on the opening hole by winning three nearest-the-pin contests for a total of 600,000 dollars , with that money reportedly coming from the players themselves and being donated to charity. "A day like today is not going to take anything away from his (Woods') greatness, he's the greatest of all time, but to have some smack talk for the next few years means a lot to me because I don't have much on him," Mickelson said. Anyone hoping to see a high-quality, meaningful contest between the pair would have been better served by watching the preceding programme on Sky Sports, namely highlights of the 2005 Ford Championship at Doral. Mickelson went into the final round with a two-shot lead over Woods, who birdied the 17th in a closing 66 to prevail over his playing partner, who lipped out with a chip on the 18th to force a play-off. The victory took Woods back to the top of the world rankings. In contrast, the majority of the play in Vegas was so mediocre that various members of the commentary team were moved to comment. "This is some crappy golf," said former NBA star Charles Barkley, who apparently speaks from experience of his own less-than-stellar skills on the links, while former Open champion Darren Clarke conceded after 10 holes: "We need a spark, we need something." Even the possibility of winning a million dollars for an eagle on the par-four ninth failed to produce the requisitie spark, Woods hitting his approach to 80 feet and Mickelson coming up short in a greenside bunker. By that stage Mickelson was one up after Woods had three-putted the previous hole to make his second bogey of the day, but Woods did at least birdie the 11th and 12th to edge in front for the first time. Mickelson won his third nearest-the-pin contest on the 13th, a victory worth 300,000 dollars , and also converted the birdie putt from nine feet to get back on level terms, before edging in front on the 15th after Woods failed to get up and down from short of the green. Mickelson edged in front again when Woods bogeyed the 15th and the left-hander looked set to have a putt to win the match on the 17th when Woods missed the green with his tee shot. However, Woods chipped in for an unlikely birdie and Mickelson could not match it from 12 feet, meaning the match was all square heading to the 18th. "You've been doing that crap to me for 20 years, I don't know why I'm surprised now," Mickelson told Woods, who then surprisingly conceded Mickelson's putt from three feet to keep the match alive on the 18th having already made his own birdie on the par five. The players returned to the 18th for the first play-off hole and Woods missed from seven feet for a winning birdie, meaning the makeshift hole from the putting green to the 18th was required. three feet at the third time of asking to finally seal victory.